his artist's impression shows quasars scattered throughout the cosmic web in the early universe. A spooky new image shows a web of bright galaxies aligned in the largest structures ever discovered in the universe. Scientists working with a telescope in Chile discovered the alignment by studying 93 quasars — objects that shine very brightly and are powered by supermassive black holes — from the early universe. 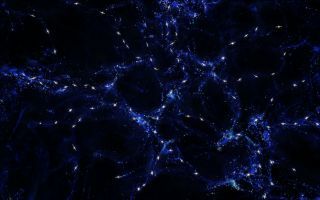 The picture (an artist's impression created using data collected by the European Southern Observatory's Very Large Telescope) shows the quasars aligned in a web of blue against the black sea of space. "The first odd thing we noticed was that some of the quasars' rotation axes were aligned with each other — despite the fact that these quasars are separated by billions of light-years," study leader Damien Hutsemékers, from the University of Liège in Belgium, said in the same ESO statement. Hutsemékers and his team also found that the quasars' rotation axes were linked to what is called the large-scale structure of the universe. Previous studies have shown that galaxies are not distributed evenly throughout the universe. Instead, the large star-filled objects clump together in a web, and this is the large-scale structure of the universe, according to ESO. "The alignments in the new data, on scales even bigger than current predictions from simulations, may be a hint that there is a missing ingredient in our current models of the cosmos," team member Dominique Sluse of the Argelander-Institut für Astronomie in Bonn, Germany and University of Liège, said. This simulation shows the large-scale structure of the universe. Team members said that the likelihood these results were created by chance is less than 1 percent, according to ESO. The new study is detailed in the Nov. 19 issue of the Journal Astronomy & Astrophysics. The European Southern Observatory is a collaboration of 15 different countries including France, Brazil and Denmark. ESO is responsible for operating three observing sites in Chile at La Silla, Paranal and Chajnantor. The Very Large Telescope is based in Paranal.